David Bradshaw and Gavin Shell of the Patriot project kindly answered some questions about 5551 The Unknown Warrior. CAD image highlighting the snifting valve. By Kevin West. When did project start, and how? How did a new-build Patriot come to be the National Memorial Engine? Back in 2007 when Tornado was nearing completion David Bradshaw, joint founder of the GW Society County Project was daring to dream about new possibilities in railway preservation. One of his biggest regrets was that a LMS Patriot class was never saved for the National Collection despite one being a memorial engine. Knowing what it takes to launch a project David along with editor Danny Hopkins and former editor Tony Streeter of Steam Railway magazine wrote an article asking if there was enough support to launch the project. 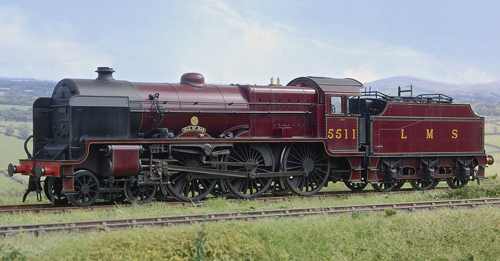 At the time there was no other LMS new build on the cards with all the other Big 4, and BR standards, being represented. Quite quickly there was a large enough response to launch and set the project into motion. Early on all we wanted was publicity and the idea of naming it was very much publicity driven. The readers of Steam Railway produced a great number of possible names many of which were military related – the successful name happened to be the one that had most ticks behind it and The Unknown Warrior was a clear winner. This then gave rise to the idea of it becoming a memorial locomotive. What will be the cost, approximately, of the locomotive once it’s complete? While I wish this was an easy question to answer it depends what you mean by costs. 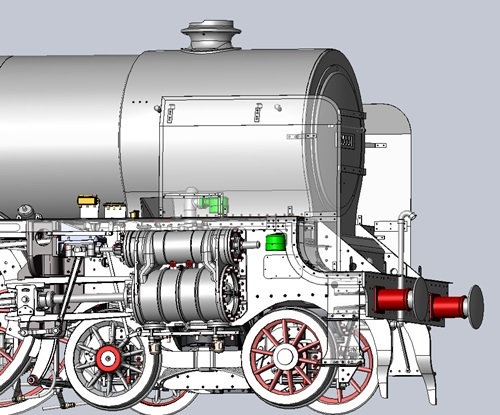 While the locomotive will probably cost around £2,000,000 the project cost will be around £2,500,000. You might ask where is the other half a million pounds going, but when you start to add up buying merchandise (£15,000 per year over 10 years is £150,000), printing newsletters and postage, administration fees, accountants, publicity, fees for sales stands, the list keeps going on and on. This is something to bear in mind when launching any project of this size – well, unless you’re lucky enough to win the lottery! Progress on the Patriot has been remarkably quick, not least to meet the obvious deadline of the centenary of the end of WWI. What factors have been the secret to achieving this speed? Sometimes you are just incredibly lucky in the timing and catching the eye of the right people, and our project managed to do just that. While many of us in the project joke about not understanding what our Company Secretary, Richard Sant goes on about half the time, he is an ex-lecturer… Need I say any more, he was exceptionally quick in setting up the company, gaining charitable status and creating ties with the Royal British Legion at his own expense. Having someone with these skills was priceless in the early days and still is. The third of our original trio of directors (David Bradshaw and Richard Sant being the others) was Andrew Laws who quickly set up a website and started creating the newsletters that we send out to keep members in the know. He quickly realised that the railway magazines wanted to hear information about progress on the project and would send them all sorts of information which quickly showed readers that we meant business and this kept the donations coming in, allowing further progress. From there on the number of volunteers and directors has grown, all filling a valuable role and increasing the ability of the project to achieve its aims. Having a group of people all with different ideas and backgrounds is fantastic as it keeps pushing the boundaries of what’s possible, something our chairman is always wanting us to do. What do you feel are your greatest achievements to date and what are the remaining major milestones from now to completion of the locomotive? One of the things our engineering team always likes to pride itself on is the ‘can do’ attitude and searching for alternative and possibly cheaper methods of production for parts. For those new to this project, our big achievement came when we were having a chance conversation with Bob Meanley of Tyseley, he mentioned the method of using polystyrene pattern castings. We enquired with Premier Patterns about what could be achieved and how much it would cost and found it not only to be extremely cost-effective but also a saving in time. As you can imagine to make a wooden pattern would have taken about six months non-stop work but obviously the pattern maker couldn’t turn away all other work for six months so this would be more like 12-18 months, whereas the polystyrene took just over two weeks from ordering. If we could go back to the beginning of the project we would certainly have used this method for the frame stretchers and other castings produced. With the pattern drawings now stored on a memory stick we also don’t have to have an entire container full of wooden patterns that are no longer needed. If we ever need another pattern then it won’t take long to have one made. With so many parts either on order or already in stock our major milestones left are to have a complete boiler, possibly the first to be built in the UK to such a large size since 1962, a complete bottom end, completed tender and of course a fully working engine. 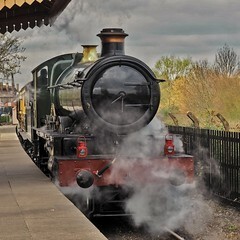 But the milestones don’t stop there as we have decided that it will be a main line registered locomotive, so our paperwork has to be all in order and we need a support coach, something that we don’t yet have. The quantity of surviving components from scrapped locomotives seems remarkable – which items on The Unknown Warrior have been sourced that way, and how do you go about finding, securing and preparing components from ‘heritage’ sources? While obviously a lot of the locomotive has had to be made from scratch we have been lucky in securing parts from all over the place. In the early days we acquired a Fowler tender which was left as part of the Barry 10, we used the wheelsets, two axle boxes and restored the springs along with a number of salvageable items. Then we were informed of a set of LMS buffers from a steam crane being scrapped at GCR(N) Ruddington which we acquired. Along the way we also purchased a large proportion of the motion. Sections of the coupling rods being stamped up as the Patriot No. 5546 Fleetwood and the rest from members of the Jubilee class (5562/5697 and 5699). Then a number of items from the donor engine 8F No. 48518 being offered to us meant that we had acquired one of the wheelsets for our bogie. A vision of the future – Lee Marsh Models’ rendition of 5511 Isle of Man in the Crimson Lake livery selected as the first to be worn by The Unknown Warrior. How has fundraising for the project worked – what kind of person is donating the money, how do you find them, what are the revenue streams? Some new build projects appear to attract a demographic of above-average affluence for rail preservation – is the Patriot one of these? Funding as any project will find is one of the biggest headaches we get in preservation and with our project also having the added pressure of the date of completion we have always been up against it. But saying that we must be doing something right as our income is something I’m sure most groups would be happy with. My personal interest in the project has always been in funding rather than engineering and I try to look at as many other groups as possible to see how they are raising the cash. In the early days we looked at the A1 way, and still very much do, of lots of regular donors giving a small amount every month. But that alone is never going to build an engine, you need to top it up with additional income where ever you can. We are lucky in that we have a few large donors who have over time given very large sums of money that have helped jump the project a few months ahead by being able to order a large component or even pay for the unattractive cost of things like labour or machining. One of the biggest success stories has to be our sales stand. Without this I honestly don’t think we would be anywhere near where we are today. The stand isn’t just about making a few extra pounds on merchandise though, it’s a multi function tool. It allows members to come and speak to us directly and frequently all around the country, you can see from our website how often the stand is out, and it gives any would be new members the chance to ask questions before donating their hard earned cash. This must be the largest way we have signed up members over the years. It also allows our members/supporters to buy our clothing and further publicise the project by having a fantastic logo that is very recognisable, I’ll be honest and say that I would be quite disappointed if I attended a steam gala and nobody attending was wearing something bought off the stand; thankfully that doesn’t happen very often. Going back to an earlier comment about frequently getting progress news to the press is very important in gaining donations also. Leaflet inserts have been very successful in the railway press but timing has to be key and we have often tried to time this with something big happening in the build to maximise the support. One thing we can’t count on though is Heritage Lottery Money. As a new build we are seen as lacking in heritage so that way has yet to gain much money, but if any other projects manage it I would love to hear from them!! Who does the work on the locomotive? All work on the project so far has been done by either the supplier of the part, Tyseley, South Devon Railway, LNWR Crewe as a few examples or by Llangollen Railway Engineering. We recently started a small volunteering team on the painting down at Llangollen headed by volunteer David Hughes. Many people from Bahamas Locomotive Society and the railwayana world will know David very well (this project has too many Davids!) and we are about to start a volunteer team headed by retired Llangollen Railway CME, Dave Owen which will start to look at the lubrication pipework and other fittings. The biggest obstacle we have overcome so far is understanding Richard Sant, actually I’m not sure we have done that completely yet. But in all seriousness I think it would have to be understanding the environment we are working in. From an outside perspective we often look at things and see everything as “you just order a part and it turns up”, whereas in reality it’s no way near as simple. You often hear of locomotives overshooting their deadlines for re-entering traffic and wonder the reasons why, but when you get into it and you order a part that’s crucial to an area of the build and it arrives slightly different to the spec you ordered you can’t just go and get another one straight off the shelf, you have to go back to the beginning of the supply chain as nearly every part is specific to our locomotive. So time very quickly disappears which is obviously frustrating when you are working to a deadline. Why has Llangollen emerged as such a strong base for new builds, do you think? Personally I have to say Llangollen Engineering has a very ‘can do’ attitude. With this in mind and the quality of the work that is completed it’s very quick to realise why so many other groups have enquired. Archival research has yielded only a partial set of drawings for the Patriot – where did you look, and where did you draw blanks? First drawings came from the Bahamas Locomotive Society which were A4 and had to be blown up to A0 which caused difficulties with the measurements as fractions were most difficult to decipher. Later we picked up drawings from the NRM and a complete set of Royal Scot drawings from the NBL archive at Glasgow University. The Scot drawings were extremely useful but despite people thinking that the Patriot was a Scot with a smaller boiler there are notable differences which we quickly became aware of. Other drawings came from the late Alan Savage who acquired some of the main drawings from Euston in the late fifties. A complete set of boiler drawings which were Crewe (all the rest were Derby) came from the NRM. There is a dearth of detail drawings hence Kevin West is having to draw up most of them from the GA’s. What do you make of the medium to long-term prospects for steam on the main line? Things seem to be shifting somewhat, e.g. with defined train lengths, at least one possible new operator, doubts over the future use of Mk1 stock – how do you expect the future main line environment to work for The Unknown Warrior? As with anything we will have to see when we get there. For the time being Mk1s are running on most charter services and with our current ambition to just supply a locomotive it wouldn’t be up to us to replace these. However we currently only plan to run vacuum brake stock but own an air pump should we wish to look at other options. I do feel that there is a large number of people who wish for day trips out behind steam locomotives to nice destinations around the UK and not necessarily all of them rail enthusiasts. The premier dining experience has catered for this very well and could be the future for this style of travel, as with the VSOE. But as long as people keep booking to travel behind steam – and hopefully our locomotive will be the one they choose – then I’ll be a happy man. Finally is there any advice you (Gavin) would personally give to other new build groups or people with the idea to start a new build group of their own? First of all, Rome wasn’t built in a day. You can never expect to just post a piece in a magazine saying that the project will start and expect the money to just start pouring in. You have to get out and about and push your project, if you’re not willing to do this then you need to find some big donors to help you achieve your dreams. Get information out in as many ways as possible, magazines, social media and sales stands are a few but look at other avenues, both 5551 and 6880 have taken their part-assembled locomotives to Warley for instance. Keep volunteers onside, give people the opportunity to be creative and I’m sure after a while they will think of great ideas. Enjoy challenging conversations, if you never challenge each other then you’re not pushing the project to completion. Remember your membership and try to give them something back or let them have a say on what happens within a project such as we did with the livery vote. When you spend so much time chasing people to join you don’t want to just lose them a few months down the line. And finally have fun, make new friends and enjoy what you’re doing. A project with a good group of friends gives off a great energy and people will want to be a part of it. Just remember a set of wheels fitted to the frames is merely the start of a very long journey and everything costs more and takes longer than you think. With any new build there also needs to be some realism. Not everybody is able to get a project off the ground. While I’m a massive fan of new builds and being only 30 years old I often wonder what stunning locos I will see being built, but I also have a feeling in the back of my mind that says are new builds really the future? While we have great ambition to see a variety of lost locomotives from the past my experience of the people who are donating to these sorts of projects are of the older generation who either remember them or at least remember pre-1968. You would need to seriously look at where you would find your funding. All images courtesy of the LMS Patriot Project. Previous Previous post: Fantasy New Build – the result! 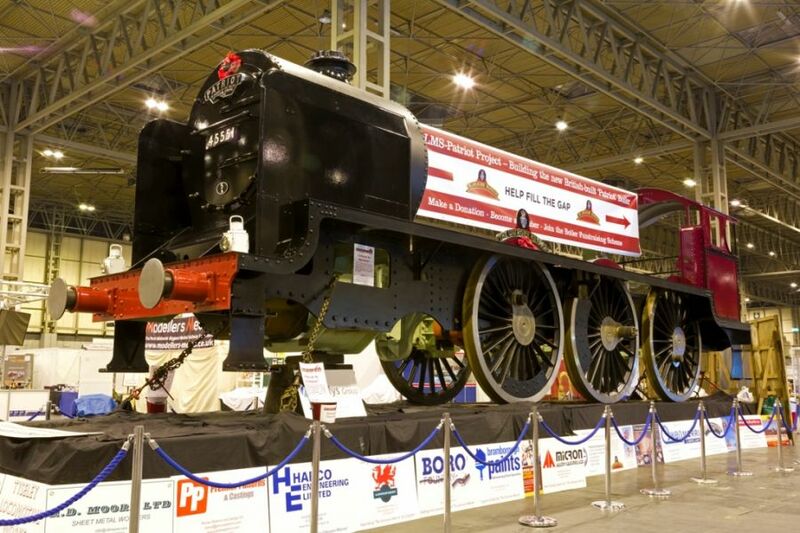 This is one impressive project as enthusiasts seek to fill the gaps in our national collection of preserved locomotives. Great article. This is the sort of news story which could be done on all new build projects as it is often quiet hard to find information on what is happening within these projects. Glad you enjoyed it, Peter. We do bi-monthly round-ups on all the available news (some projects disseminate more info than others, though). We’ll be inviting all projects to complete a Q+A of this sort, running one every other month. They’re not news items as such, though – you’ll notice that there was little new factual information in this piece, albeit there was a lot of really interesting insight.